Introduction: The archaeological record shows that linen was an important part of Viking Age clothing. Linen cloth developed gradually from being virtually nonexistent in Scandinavia at the start of the first millennium AD, to being an important part of fashion during the Viking Age a thousand years later. The importance of linen is also very visible among the many re-enactors of the period, and every self-respecting ”leisure Viking” will own at least a shirt or a skirt of linen. Re-enactment is also done professionally, as part of the tourist related activities in Visitor centres and museums across the country. Ribe Viking Centre is such an open-air visitor centre, recreating authentic milieus from Ribe and its nearest surrounds during the Viking Age. The centre also works as a teaching institution, where young people, for which the normal school system is not currently a viable option, can get a different kind of schooling experience, and therefore be helped further on in the educational system. Both staff and pupils on Ribe Viking Centre are therefore dressed as “Vikings” during the tourist season, where they work with different crafts across the site, recreating a living experience of the Viking age, at least in aspects. In this they make a valuable regional contribution to the tourism industry as well as playing an important role in social and educational aspects of contemporary society. From the University side, we have gained much respect for the professionalism and success with which both tasks are handled on an everyday basis at the Viking Centre. 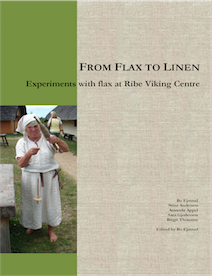 The main parts of the garments worn at Ribe Viking Centre are made from linen. Visitors to the Centre will therefore be met with a vision of the Viking Age, where linen is a very dominant part of the fashion during the period. But it this true? Or possibly one should better ask: What kind of effort would such an extensive use of linen represent? One thing that we did notice during our work at the Centre was that while visitors could readily appreciate the effort behind the buildings and the crafts shown at the centre, the clothing was a more invisible factor, even though the making of clothes must have been an important part of life in the Viking Age. The work presented in the following helped illustrate just how important it must have been.